* Normally cycling women versus women using hormonal contraceptive methods. 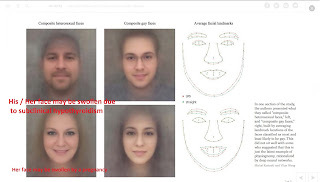 "Ovulatory cycle and changes in face width: How women can tell when other females are ovulating using clues in their face - and how they may then try to hide their partners from the 'threat' of these fertile ladies (Women's attractiveness changes with estradiol and progesterone across the ovulatory cycle)"
* Her face may be swollen by a pregnancy. * His / Her face may be swollen due to subclinical hypothyroidism. * Persons with facial surgery or even worse Photoshopped / altered / retouched images (nose, lips, eyebrows) can introduce bias in the algorithm. (212) gender of the partners that they were looking for (according to their profiles). "Gay and heterosexual people were represented in equal numbers. " Perhaps it is a flaw. Gay people are OVERrepresented in the sample. Perhaps Gay people should be less than 10% in the sample. 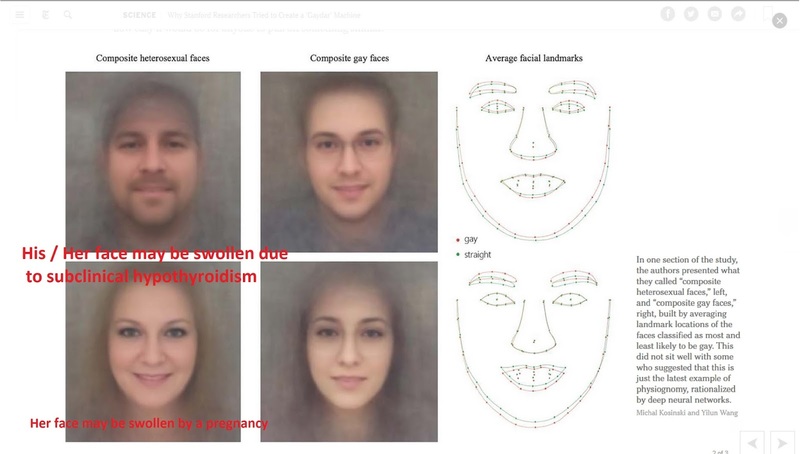 If in real world heterosexual people are 90% of any REAL / REPRESENTATIVE sample of any real population, and 10% are only Gay and Bisexual, it will be easy to any algorithm to achieve 90% precision detecting heterosexual people! It only needs to say all of them are heterosexual people and it will fail for a 10%, i.e. 90% precision !